Start with the obvious: First, step back and take a look at the exterior of your home. How is the paint, roof, siding? Things to look for include peeling paint, cracked or rotted materials. If you do nothing else to up the of your home, do these things. Structural integrity of a home is a huge concern for anyone. Remember the siding issues of the mid 2000s? People still have concern over siding integrity today, especially as some owners never bothered to replace the improperly installed siding. So imagine if people can physically see something rotted or in disrepair. They are going to steer clear. Repairing these issues can help up the foot traffic to your listing. 2. Make that front door pop! The front door of a home is a focal point when looking at the exterior. The most important part of the door is that it functions properly and is not all scratched up/dented/peeling, but it can also be used as a statement piece for the home. A homeowner may achieve this by either installing a custom door, or giving an existing one a pop of color. Another way you can make the entryway of a home pop is to add molding to the top and or sides of the front door. Not all changes have to be drastic. People tend to underestimate the impact that simple changes can have. One such change, is replacing outdated, or worn hardware on the home. 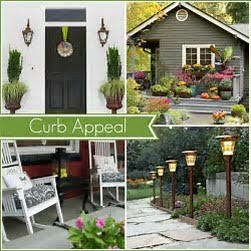 Bringing in new hardware, can add personality or flair to the exterior of a home. Some areas that can benefit from updating are the house numbers, wall-mounted mail boxes, light fixturing, and the front door locking mechanisms. There is just something about having things in symmetry. It looks so clean and appealing. Whether you apply this concept to planters, light fixtures, or other accents, having your accents in balance can help achieve a clean and peaceful aesthetic. We are blessed to live in a gorgeous and verdant state. It is normal to have greenery accessible at the fingertips, but taking the time to assess how it is presented can be the difference in whether people are drawn to a home or drive by. People love buying homes they feel comfortable or can relax in. This plays back into symmetry a bit. Make sure that the presentation looks clean, that any plants/bushes are pruned nicely, and weeds are removed. If the barkdust or soil is faded from the sun, adding some fresh will help boost color and freshness. Have fun and add some more color by adding some cute planter boxes, such as window boxes, or a mail box garden. What ideas are the most appealing to you? Any that weren’t mentioned that you feel helps add to the curb appeal?